My Eating Out in Alsace, Basel and Baden page in another corner of this site is my personal and opinionated selection of good spots to eat out in our three-cornered region: Alsace/France, Basel/Switzerland and Baden/Germany. Trouble is, it’s a bit like Topsy: it just growed and growed. It got so out of hand, I finally decided it needed a spot of pruning and some separating and re-planting. I’ve now split the reviews into three separate sub-pages, Alsace, Basel and Baden. Between them all you should find something for every occasion, whether you’re after a budget Indian or a big birthday blowout. A key factor is that they’re all (for me) happiness-producing kinds of places, ones that I’d go back to (and frequently do). Recent additions to the Alsace page include a great little wine bar in Colmar called L’Un des Sens. It’s the perfect answer for anyone who’s into quirky, interesting, mainly ‘natural’ wines, with a big selection on offer by the glass. They also serve toothsome charcuterie, gorgeous cheeses and wicked bread to mop up the wine, and there’s a tempting little terrace out front for whenever the sun returns to these parts. 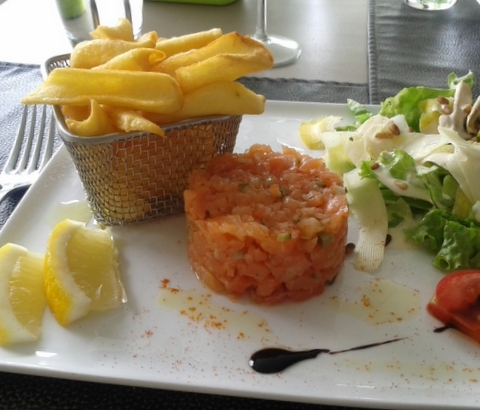 Another fave is A Table Chez Marie in Hagenthal-le-Bas. For reasons I find hard to fathom, it’s a place that divides opinions so I find myself waging a one-woman campaign for their style of cooking: French bistro with some cheeky little twists and turns, like the exquisite waste-not-want-not soup featured on the header to this page, made from broad bean/fava pods, stock and light cream and served with little crostini-type mouthfuls topped with goat’s cheese, crunchy lardons and double-peeled beans; or the home-smoked salmon tartare (below) with some of the best chips in the business (and this from somone who really, really doesn’t do frites). Another new entry is La Maison de l’Inde in Saint Louis, where they do north Indian food with huge panache and great good humour and at eye-rubbing prices (eye-rubbingly reasonable, that is). No pics of their gorgeous pakoras, samosas, kormas, chicken tikka masalas and garlic naan bread, so you’ll just have to go see for yourself if you haven’t already done so – though it seems that just about everyone knew about this place but me, and I’m a bit late to the party. The Auberge Sundgovienne, a family-owned country inn on the main road just outside Altkirch towards Belfort has had a makeover – I’m pining to test their new terrace and catch up on the summer menu and good wine list. 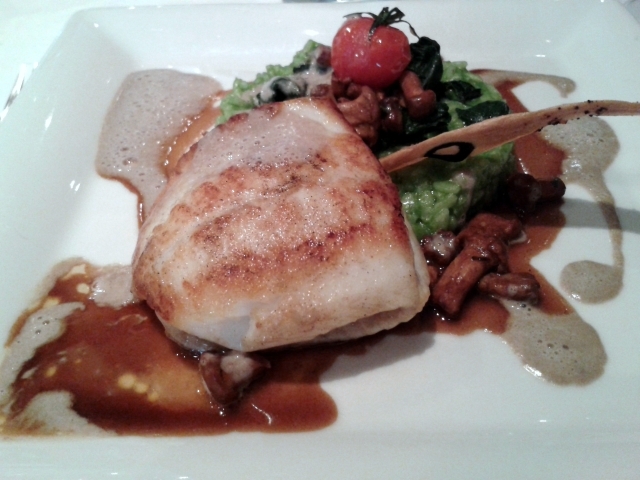 Last time we were torn between their fishy offerings (viz turbot, below), the Irish beef and the racks of lamb. La Cheneaudière, a relaxing Relais & Chateaux hotel with restaurant up in the Vosges at Colroy-la-Roche is another newbie to the Alsace page, included in my recent lineup for Decanter of top dining spots in Alsace. 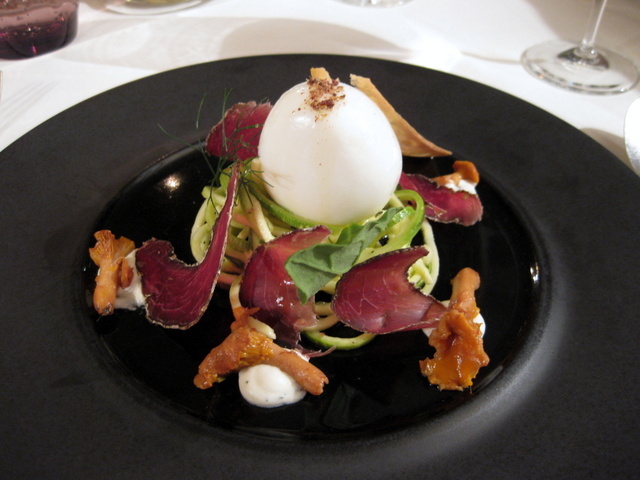 Chef Roger Bouhassoun does food with attitude and a strong sense of ‘somewhereness’ (soft-boiled eggs with chanterelles from the Vosges and the chef’s home-cured ham (below), locally farmed snails bathed in a herby foam, slow-cooked pigeon breast with the legs parcelled up in crisp brik pastry). Sommelier Rodrigue Palvadeau is a mine of info and well attuned to what’s new in the vineyards of Alsace – thanks to him we discovered the wines of Vignoble des Deux Lunes in Wettolsheim, run by the two sparky Buecher sisters. Stop press: a brand-new addition this week (2 June) is Ferme Auberge Deybach in Schnepfenried, situated at 1000 metres in the Vosges, high in the Munster valley. Count on the classic repas marcaire, which consists of a slab of tourte (pork pie in flaky pastry, served warm), kassler (smoked pork loin) with the unspellable, unpronounceable and unbelievably delicious roigabragelti (a gratin of potatoes, onions and tons of butter) and to wrap things up, a choice of meringue glacée or the house Munster cheese, made from the milk of the speckled Vosgienne cows grazing just outside the window.